Over the past two+ years, I’ve recieved tons of amazing questions from readers. Most often they come through the Contact form, but sometimes people message me on social media, or just comment on a post here. Lots of younger guys are reaching out via Discord lately as well, which makes me happy. 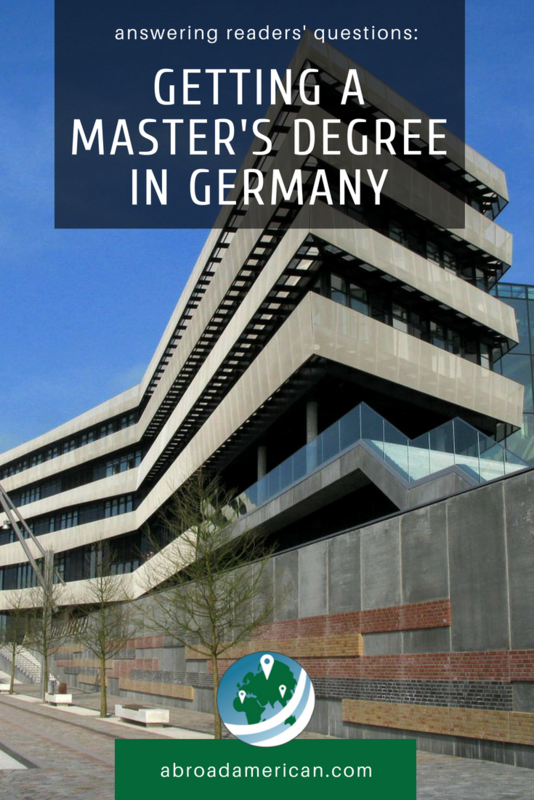 Questions about getting a master’s in Germany are quite common – it might be the most frequent topic I get questions about, actually. 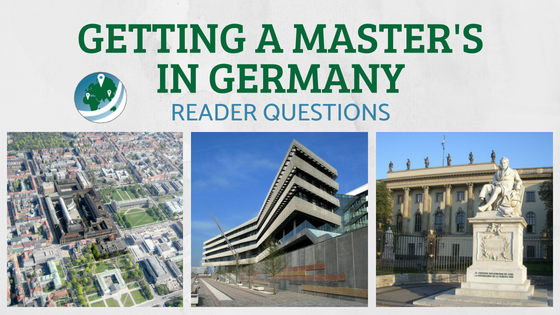 All of the questions I get are great (okay, maybe not ALL…), so I’ve plucked out some of the most relevant exchanges to share with those of you looking into getting a master’s in Germany. TUM on the left (image credit: Maximilian Dörrbecker (Chumwa) [CC BY-SA 2.5 (https://creativecommons.org/licenses/by-sa/2.5)], from Wikimedia Commons), Hafencity University of Hamburg in the middle, and Humboldt University in Berlin on the right. The first Q&A pair I’ll put in this post is actually my most recent. A couple of weeks ago Melanie reached out to me via email after commenting on the Thinking of Moving to Munich? post. Even though her main question was about a specific type of degree, I think she touched on lots of very important issues many people might have about getting a master’s in Germany. Thanks for your speedy reply to my comment. Since I discovered your blog, I have obsessively read your articles and researched master’s programs. I have thought about going abroad for my master’s before, but this is the first time I’m taking it seriously. Truly, that is all thanks to your writing. You do an excellent job of breaking down a complicated subject so it’s not so overwhelming. Your blog is simultaneously fun and informative. Last question. In my research, I’ve come across a few blogs that say that it’s not worth it to get a master’s in Germany because the education system is so outdated. Thoughts? I trust you more than the Internet ranters, but I think it’s a valid concern when the education is free. Thank you so, so much for your time. Keep putting out great content! Sorry that it’s taken so long to get back to you. I was a little sick and quite busy with side jobs and getting all the legal matters of being a freelancer/person who sells things in Germany out of the way. First off, thank you so much for the kind words!! Hearing back from reads about how I’ve somehow been able to help them is what keeps me going, so a big herzlichen Dank to you! Education master’s degrees, as in any country, are usually focused on the educational system of that country. That means that a master’s in education here in Germany is going to be aimed at teaching and staying here, whether it be with kindergarteners or with university students. Either way, I can’t see too many of them not being in German, though the ones that are (which you seem to have found), are probably focused on education more broadly. At least, they’re probably not focused on heading into the German education system. Education is a toughie exactly because it’s so different in every country. Much like accounting, law, or any other specialized and regulated profession. Are you looking into other master’s programs besides education? It might be hard to get into one too far off that track if your bachelor’s was in education though, as most master’s require you to be in a “consecutive” degree. As for Berlin and Munich, obviously, I’m a bit biased. Both cities are very international in their population, but Berlin probably feels a bit more internationalized (and also more Americanized) than Munich. The Bavarian capital prides itself on some traditions and rebuilt itself after the war in the same way it was organized before 45% of the city was turned to rubble. Berlin is certainly not a bad choice, however. I don’t think you can go wrong with either. Is the Education System in Germany Outdated? For your last question – personally, I wouldn’t listen to those people. They seem to be generalizing every degree, at every department, at every university in the country into one monolith of outdated education. Some aspects of the university system here are a bit outdated and I do have my qualms with (see some of my uni-related posts). But I don’t think its fair to say its outdated. Each of the states of Germany almost totally controls their own education system, with a few exceptions. University regulations are pretty similar across the country and across Europe but a program in Munich could and would probably be a very different experience than a program just an hour away in Nuremberg. Like Anywhere… It’s a Mixed Bag. More advanced (aka usually the larger and usually more prestigious) universities seem to have a mixture of both outdated systems and great new ideas and programs. That’s not to say that some smaller university in a smaller town isn’t doing some great things. I’m sure that’s the case somewhere! Aspects of my programs were new, exciting, and very relevant to the kind of work most of us wanted to pursue. Other aspects were not. Some seemed out of place or not relevant to our study. However, with such a broad group of students in an international program like mine was, I can see why a lot of these courses were kept in the curriculum. Basically what I’m trying to say is the “outdatedness” of any given program depends on what you’re studying, where, and who’s in charge of the program and your professors – as I think it would in any country. There’s far too many variables in there to make a such broad and sweeping generalization like “education in Germany is outdated”. Thanks again for reaching out and also for your kind words! It is much appreciated. 1. I’ll be starting my Masters at the age of 28. Will I be out of place in Germany? 2. I’m only considering applying to 1 or 2 programs. Is that atypical? I’m from a top tier university in the US with solid grades (final GPA was 3.8, which is 1.3 when converted to the German scale). 3. Can I ask what type of Master’s you applied for? And how many applications you did and admissions you got? 1) not at all. There’s definitely much less and a age issue here as there might be in the US in some cases. One of my best friends was even a little bit older than you when we started our program, he fit in just fine. I was 25 when I started. It’s really not a big deal at all, especially in the more international programs, which tend to attract an eclectic bunch. How Many Master’s Programs to Apply to? 2) no idea if that is typical or not, but I’d presume it varies widely depending on the availability of programs and the eagerness of the applicant. 3) no problem! I applied for 4 different programs, 3 here and 1 in Belgium. All were followups of various kinds from my civil engineering background. I’ve just finished my M. Sc. Transportation Systems program at TUM, and I also applied to the Urban Agglomerations degree in Frankfurt, the resource efficiency in architecture and planning program in Hamburg, and another in Belgium which I’ve forgotten. I got into all 4. I think the average is probably between 2 and 3. Again, it probably depends on a bunch of things though. Thanks again for the contact, I hope I’ve been helpful! Where are you applying and for what, if I can ask? That’s a relief on the age thing! I’m looking at the Management Master’s at TUM. How did you like TUM? How was your application process? And as a follow up, do you remember what you needed to do for your transcripts/diploma? My diploma is in Latin (which I guess would require me to have it translated? ), but my transcript lists my grades and the degree I earned. Also, my undergraduate university’s official transcripts aren’t notarized with a stamp/signature. Do you know if that still acceptable if it’s the original transcript from the Registrar’s office? (Sorry about so many questions, but it’s hard to navigate this process without much information online.) Just wondering how you did these things or if you had these problems. Don’t worry about the questions man, I went through this exact process and remember how each answer seems to bring 2 or 3 more questions with it. It’s definitely frustrating because there are so many different circumstances out there, like yours with the Latin diploma, for example. – In my experience, everything needs to be in English or German. Officially translated by someone with a license or a notary translator from Latin to English. – I’m not entirely sure on this, but at least one uni in my application process required notarized transcripts. That meant ordering them directly from my undergrad university, which I could do from the Registrar’s website. I had them either delivered directly to the university, or first to me so I could then forward them onto the university, still sealed in their original packaging/envelope. This goes for the diploma too. – A lot of German universities, including TUM I believe, required something they called “higher education entrance qualification”. In Germany, there is something called the Arbitur, which all students take that sets them up for the proper higher education track. We don’t have that in the US, so what sufficed for my applications was a notarized – yes, notarized – copy of my high school transcripts and a copy/scan of my diploma. My high school didn’t have notarization services, so a copy of my transcript sealed in an envelope, which was signed and stamped on the back (over the seal), sufficed. I communicated with admissions reps from the universities to figure out if all of the above was required, and each was, in one application or another, required. Germany loves official forms. It’s just normal here, so no one thinks anything about it! Welp. That was a lot of text. Sorry about that! I hope I made it easy enough to wade through or follow along for you, so that you could find any little nugget of wisdom that might be helpful to ya. 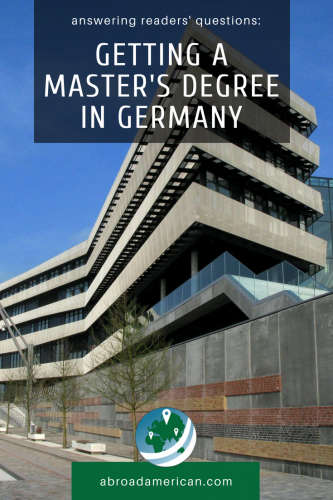 Getting a master’s in Germany, while difficult at times (ahem, ahem…), was a wonderfully beneficial experience for me. Not only did I get the chance to expand my knowledge and perspective in my field, but I also met some amazing people. Of course, I’ve learned so, so much about German culture and Germany along the way. Adjacent to all this learning, moving abroad can have lots of other benefits as well, as I’ve covered several times on this blog.